Congratulations to the winners of the thrillers. Mike Lawson's House Justice will go to Penny T. from Klamath Falls, OR. And, Ice Cold by Tess Gerritsen goes to Pam K. from Elizabethtown, PA. The books will go out in the mail tomorrow. If you enjoy mysteries involving food as much as I do, you'll want to try to win this week's books. 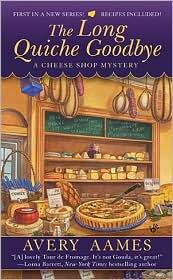 Avery Aames' first cheese shop mystery is The Long Quiche Goodbye. Fromagerie Bessette is "The Cheese Shop" in Providence, Ohio. The grand reopening of the shop is disrupted by murder. That's bad enough for shop owner Charlotte Bessette. What's worse is the identity of the primary suspect - the mayor of Providence, also known as Charlotte's grandmother. Or, you can check out the pizzeria in Timber Ridge, North Carolina in Chris Cavender's Pepperoni Pizza Can Be Murder. Eleanor Swift, owner of the shop, finds a body in her pizzeria. When her deliveryman is suspected of bashing his own brother over the head with a pizza-rolling pin, Eleanor doesn't believe he's guilty. Teaming up with her sister, she's determined to dig into the mystery, and find the killer. I have an autographed ARC of Cavender's book to give away. Do you want to win The Long Quiche Goodbye or Pepperoni Pizza Can Be Murder? You can enter to win both, but I need separate entries. Email me at lholstine@yahoo.com. Your subject line should read either "Win Quiche" or "Win Pepperoni Pizza." Your message should include your mailing address. Entrants only in the U.S., please. The contest will end Thursday, Sept. 16 at 6 p.m. PT. The winners will be selected by random number generator. I'll notify the winners and mail the books the next day. Good luck!